(editor) the process (performed by a film editor) of selecting, assembling, arranging, collating, trimming, structuring, and splicing-joining together many separate camera takes (includes sound also) of exposed footage (or daily rushes) into a complete, determined sequence or order of shots (or film) - that follows the script; digital editing refers to changing film frames by digitizing them and modifying them electronically; relational editing refers to editing shots to suggest a conceptual link between them; an editor works in a cutting room; the choice of shots has a tremendous influence upon the film's final appearance. See Best Film Editing Sequences. ellipsis the shortening of the plot duration of a film achieved by deliberately omitting intervals or sections of the narrative story or action; an ellipsis is marked by an editing transition (a fade, dissolve, wipe, jump cut, or change of scene) to omit a period or gap of time from the film's narrative; an ellipse in a script (designated in the text as "...."), either allows for a pause, and/or omits a portion of the sequence of events allowing the reader to fill in the narrative gaps. epic a costly film made on an unusually large scale or scope of dramatic production, that often portrays a spectacle with historic, ancient world, or biblical significance. Examples: Ben-Hur (1959), Titanic (1997), or Patton (1970), shown here. establishing shot usually a long (wide-angle or full) shot at the beginning of a scene (or a sequence) that is intended to show things from a distance (often an aerial shot), and to inform the audience with an overview in order to help identify and orient the locale or time for the scene and action that follows; this kind of shot is usually followed by a more detailed shot that brings characters, objects, or other figures closer; a re-establishing shot repeats an establishing shot near the end of a sequence. exploitation film a sensational, often trashy B-film aimed at a particular audience and designed to succeed commercially and profitably by appealing to specific psychological traits or needs in that audience without any fuller analysis or exposition; often refers to films with extremely violent or sexual scenes; not necessarily a derogatory term; various types include blaxploitation, sexploitation, splatter films. Examples: Beyond the Valley of the Dolls (1970), Cannibal Holocaust (1980, It. ), Porky's (1981) shown here, or any of Roger Corman's New World Pictures films, such as Bury Me an Angel (1971). exposition the conveyance (usually by dialogue or action) of important background information for the events of a story; or the set up of a film's story, including what's at stake for the characters, the initial problem, and other main problems. (and expressionist) refers to the distortion of reality through lighting, editing, and costumes, to reflect the inner feelings and emotions of the characters and/or the filmmaker; a cinematic style of fantasy film common in post-WWI Germany in the 1920s and 1930s, characterized by dramatic lighting, dark visual images and shadows, grotesque and fantastic shots, distorted sets and angles, heavy makeup, highly stylized acting, and symbolic mime-like action and characters; opposed to realism. 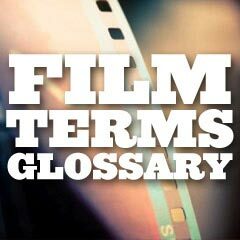 Examples: The Ten Commandments (1956) in the Exodus scene, Ben-Hur (1959) chariot scene, Spartacus (1960). Recent films use CGI to create fictional crowds of extras, such as in Gladiator (2000), or soldiers and a fleet of ships in Troy (2004) (pictured).